At over 5000 acres, Cape Henlopen State Park has a lot to offer. 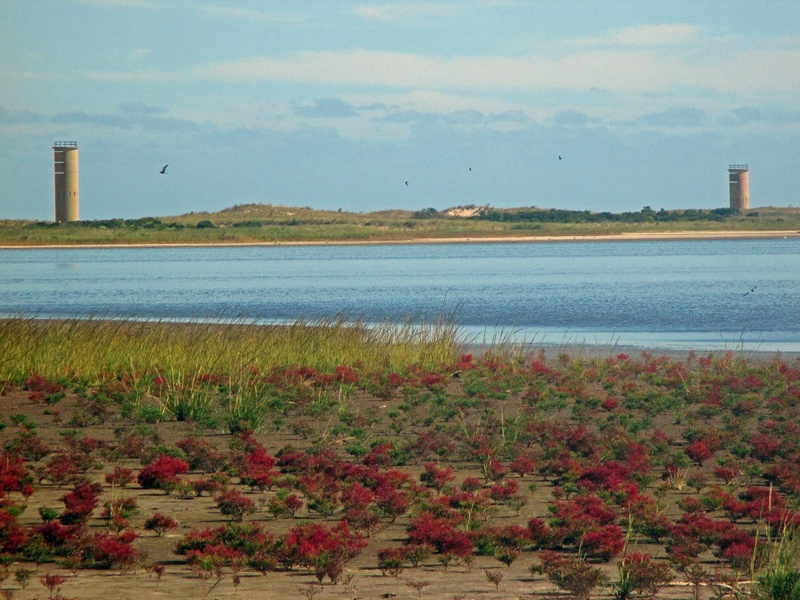 It's an ocean park with miles of sand beaches on both the Atlantic Ocean and Delaware Bay. It's a wildlife haven, for both education and conservation. It's a fisherman's mecca with a huge long fishing pier. 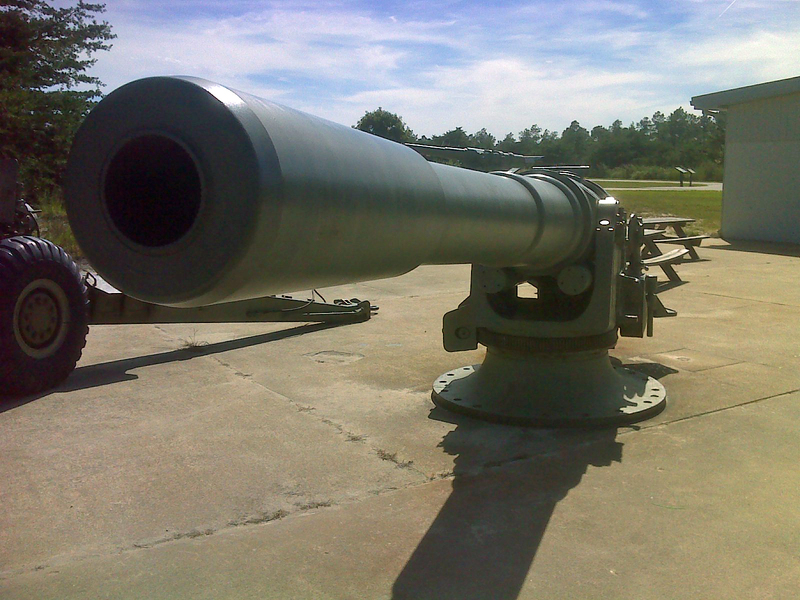 And it's a military history park. During World War II it was not a park at all but a base built to protect the Delaware Bay from invasion by the enemy. 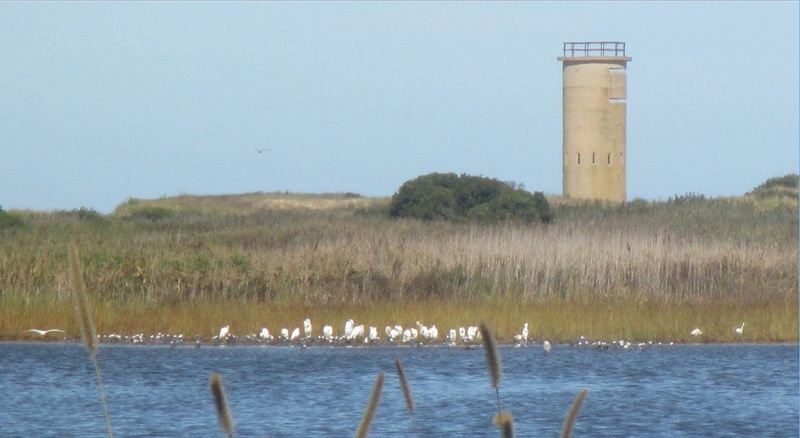 Best of all, Cape Henlopen State Park has a comprehensive network of walking and biking trails, the crown jewel of which is the 3.2 mile Gordon's Pond trail. 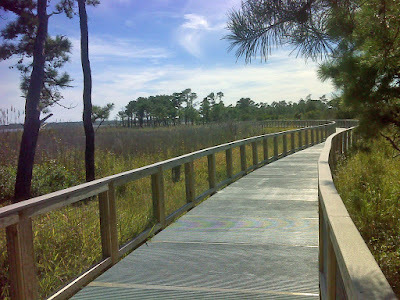 And the crown jewel of the Gordon's Pond trail is the nearly half mile of high-tech elevated boardwalk built with a special aluminum treadway that allows light to pass through, so that it has minimal impact on the environment. It's ten or twelve feet wide with sturdy handrails the entire length. Just opened in June 2014, it makes the Appalachian Trail's famous Pochuck Swamp boardwalk look like a kiddie ride by comparison, though the latter is five or six times the length. As a fit hiker on a budget I chose to park my vehicle outside the park itself and walk in. 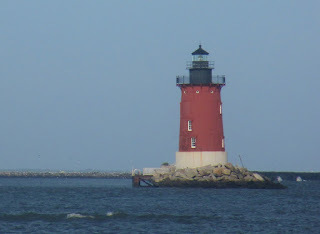 The Cape May-Lewes ferry has a vast foot passenger parking lot that is just 3/4 mile from the main park entrance, and down on the north side of Rehoboth beach, the Deauville Beach parking area is the same distance south of the southern park entrance. It may be important to note that there is no vehicle road connecting these two park entrances. The only way to comprehensively experience the park from end to end is on foot or by bicycle. My exploration of the park went in three phases: A long distance trail hike, a beach hike, and an inland hike via the bike trails. The first phase followed the route of the American Discovery Trail, which has its eastern terminus in the Atlantic Ocean beside the Hawk Watch--a unique spot that combines all three of the park's features. 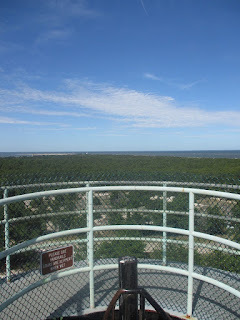 The hawk observation point is set on top of an old Bunker. The trail skirts the bunker on what looks like an artillery pad and then heads over the dune where I took a 'trail terminus selfie'. Then it was time for feet in the Atlantic waters. I have plans to hike nearly all of the ADT from here to Colorado, and perhaps eventually to get a companion shot--feet in the Pacific--at its western terminus at Point Reyes National Seashore in Marin County just north of San Francisco. Part Two of the three-part hike then commenced--the beach walk. It came in two sub-phases. 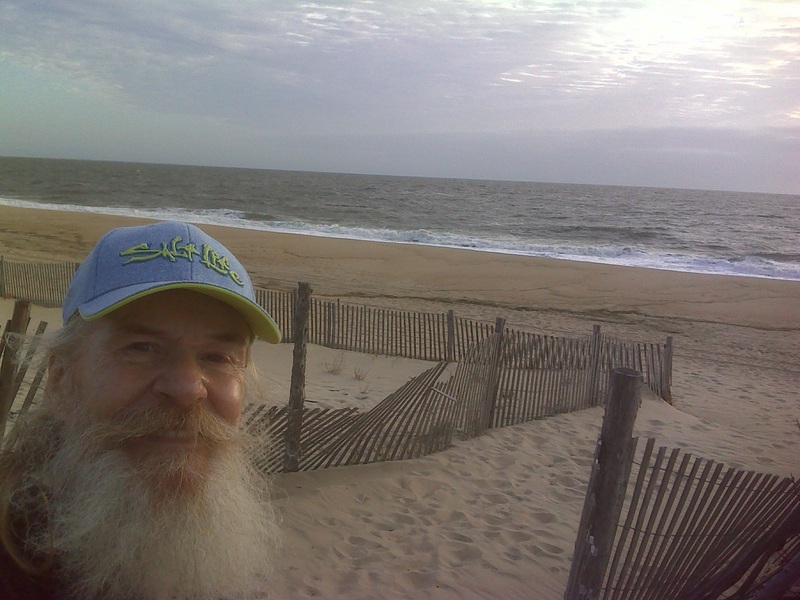 From the ADT terminus I headed north to the tip of Cape Henlopen proper where the Delaware Bay meets the Atlantic Ocean and I met a flock of seabirds. The 1926 vintage Harbor of Refuge Lighthouse is just offshore here. I rounded the cape, took a detour around a closed (for bird nesting) section of bayside beach, and continued on west all the way back to where the beach ends at the ferry terminal. 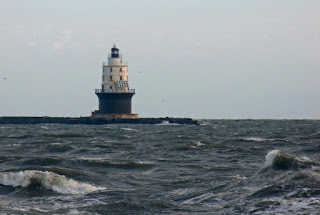 This whole section is presided over by the much older Delaware Breakwater Lighthouse, built in 1885 and still using the original fourth-order Fresnel lens installed that year. 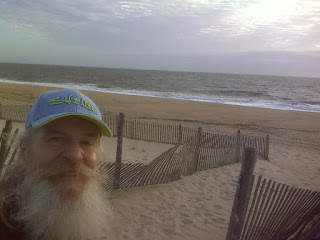 Now I hiked a bit more of the ADT to the town of Lewes, then returned and got in my borrowed vehicle and drove down to Deauville Beach, where I resumed my beach hike by going north toward the ADT trail terminus. Immediately I encountered these two venerable old sentinels. 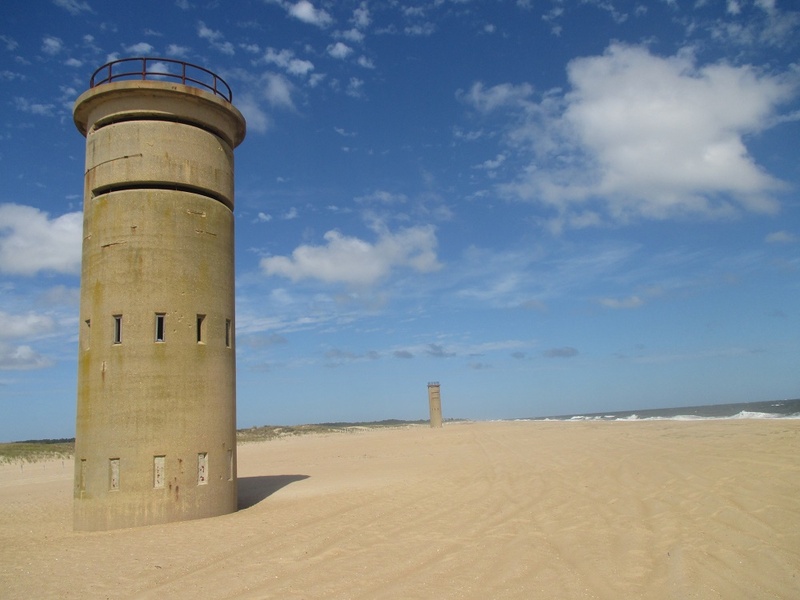 They are two of eleven watch towers built in the late 1930's and early 1940's as part of the effort to defend the Delaware Bay from invasion. They're the only ones now stranded on the beach, threatened by ongoing erosion. Several of the towers come in pairs like this in order to perform precise triangulation on suspicious targets. Here's an interpretive sign - full of great info. The beach walk finished soon after I passed the elaborate bathhouse with its boardwalk to the beach. Then I began phase three, heading inland on paved bike paths. I passed Fort Miles--the nerve center of the WWII operation, with its Spartan barracks buildings and examples of artillery on display. They're upgrading this section of the park, with completion scheduled next spring. 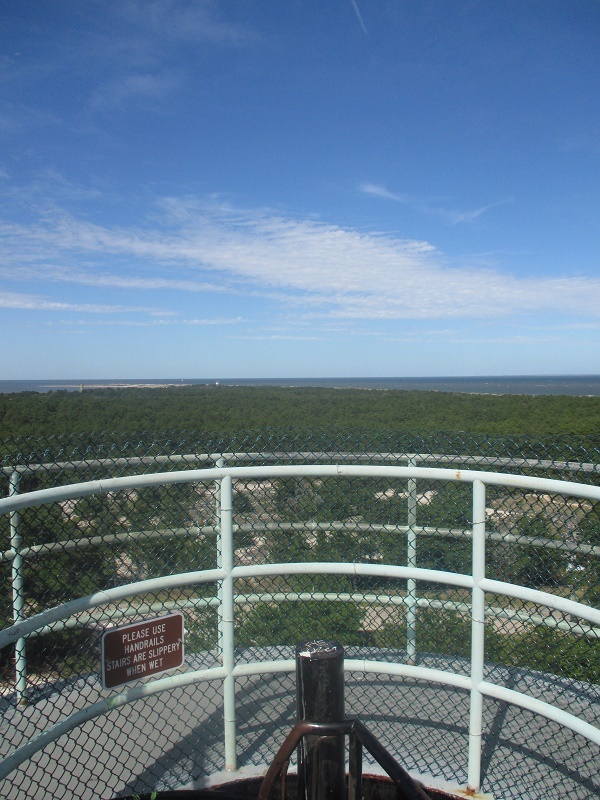 I visited the one observation tower that is open to the public -- view from the top, looking north toward the cape, is above -- then started down the Gordon's Pond trail, travelling north to south. The first thing I encountered was the boardwalk, discussed above. Then came the pond itself, resplendent on this sunny breezy afternoon. Across the pond were those two observation towers standing on the beach. And in the foreground of this shot is what looks like a mini-savanna -- an open forest of tiny trees all decked in their fall color. 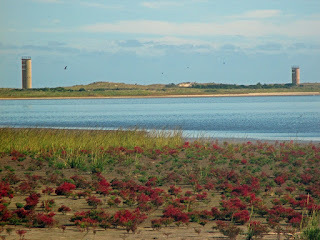 In fact, these are the little salt-marsh plant called American Glasswort, Salicornia virginica, a succulent which puts on this display in the fall. It's edible. The stems are pickled and considered a delicacy. Here's a close up of one of the little saltpan-loving plants. There were birds in abundance and quite a few photographers out on this perfect afternoon with their huge telephoto lens rigs. But even with my little hiker-friendly Canon Elph (it has an 8x zoom) I managed a nice shot or two. It was a twenty mile hike in all, but I never felt tired. I was too busy enjoying the day. Below is a map of the route, with links (the red push pins) to many more photos.